In the Bushiroad info corner, they showed a little bit of the making of video for the CD by Milky Holmes, "Pleasure Stride". There was also a short message by Milky Holmes. 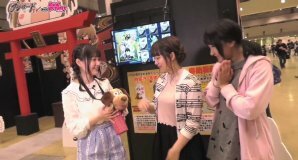 There was a corner by Ayasa where she talks with one of the other members. This week she interviewed Aimi. 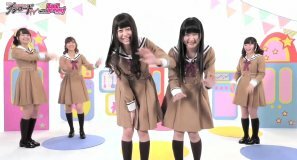 For the Poppin Party Live Library corner, they showed a video of "Hashiri Hajimeta bakari no Kimi". 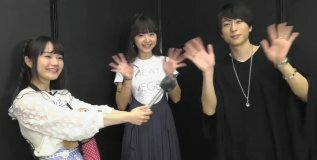 This week, Yuka's corner was almost 10 minutes. Yuka went to Big Sight for the Bushiroad 10th Anniversary Matsuri event that took place from 5/5 to 5/7. She acted like a reporter and interviewed Kita Izumi and Morishima Shuuta, who were the emcees of the opening stage. 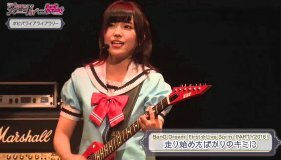 Next Yuka went to the exhibition which showed the history of the 10 years of Bushiroad. Then Yuka ran into Ayasa and Rimi, who were also at the event. There will be more on this event next week.